Carbonless forms have rapidly increased with today’s growing business needs and change in business and market strategy. Carbonless forms printing can adjust in any size but they have some standard sizes such as Letter 8.5 x 11 size, Legal 8.5 x 14 size and Half Letter 8.5 x 5.5 carbonless forms. These forms can be edge glued, snap sets, continuous feed and often padded in 50 sets per pad. As we know today almost every business requires receipts and invoices, in the past companies used pads with carbon paper but now things have changed and carbonless form replaces carbon papers. Another common name for carbonless forms is NCR forms (No Carbon Required). Carbonless forms and NCR printing services are widely used as shipping forms, invoices, receipts, medical forms, and many more other useful purposes. No one can deny its importance because they are in use for keeping records for small and large businesses and save time by not having to photo copy documents. 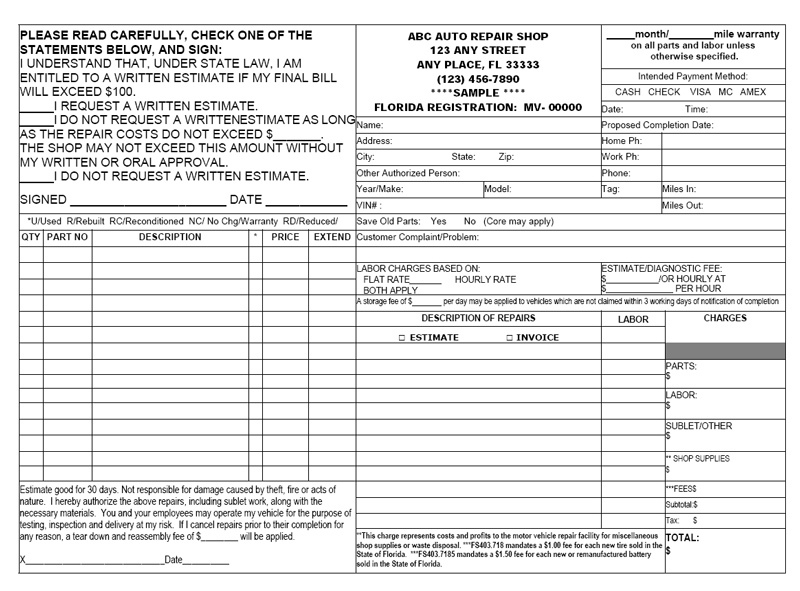 Did you know that all Motor Vehicle Repair (MVR) shops in the State of Florida are required by law to provide a written estimate and invoice? Carbonless Forms Printing Services from Executive Printers of Florida gives you the best services of carbonless forms printing. We have ability to print two, three and four part carbonless forms with various sizes. Our carbonless form printing service is renowned because of our premium quality services with less turnaround time. We are offering cheap carbonless forms printing to our customers in order to raise their business identity globally in a cost effective manner. Our NCR services are tremendous, we also have an extensive range of carbonless forms design which can be developed as per your requirement. Our carbonless form products include 2 part carbonless form, 3 part carbonless form and 4 part carbonless form. 1 color black, PMS inks, or full color CMYK printing processes available. You will get the maximum printing benefits from us because we not only provide you a high quality product but we also provide you great benefits such as cheap price, design revisions and free proof reading. Our carbonless form printing capacities take full advantage of modern day technology, providing you the best quality with a minimum price rate. Contact us for carbonless form printing.